Model YBO-BS is an addressable loop powered Base Sounder innovatively designed to give a range of tones and volumes with a maximum output of up to 98 dB(A) (±2 dB(A)) with low current consumption. 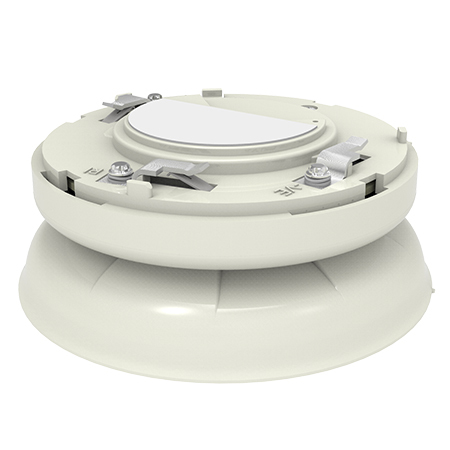 The unit is designed to fit to the Standard Base (YBN-R/3) or the Isolator Base (YBO-R/SCI – from Batch Number 6044) and can be fitted with any of the ESP Range of Sensors, Beacons or Remote Indicators. The unit can also be converted into a wall sounder with the simple addition of a Cap (SI/CAP). The sounder is Ingress Protection rated to IP21 and for internal use only. An Auto-Shutdown feature allows the user to set a fixed time within which the sounder will operate, before automatically silencing itself, cutting noise pollution (dependant on control panel compatibility).